By the summer of 1942, Ireland had seen the arrival of some sixty aircraft from the British Commonwealth and German air forces. Among the crews had been men from all over the British Empire, from Germany, the occupied European nations and also a number of American citizens. It was this latter group of airmen that were to become the focus of events on the 6th July 1942 at the aerodrome named Rinneanna in County Clare, now better known as Shannon International Airport. Up until the 6th July 1942, the American personnel who arrived in Ireland on Allied warplanes were of two types. There were a small number of Americans who had left their home nation in 1940 and 1941 and who were flying with the Royal Air Force in a combat role. This group was none better exemplified than by Pilot officer Roland L Wolfe, a pilot from Nebraska who bailed out of his Spitfire in November 1941 over Donegal and was interned until 1943. A little more can be read about R L Wolfe at this page on the site. Another small group of American citizens who found themselves in Ireland prior to July 1942 were civilian crew members on RAF Ferry Command aircraft, four of them being, Leslie Lee Garlow, Benjamin Dilley, Ernest Leak and Paul Lowman. These four civilian pilots had each been able to depart from Ireland safely, with only Lowman having had to crashland his aircraft. All of these men were serving under the government of the United Kingdom. But with the entry into the war of the United States in December 1941, the Irish Government was painfully aware that soon enough they would have to deal with the arrival of an American service aircraft with serving members of the US Armed Forces. It was clear that should they attempt to intern American personnel it would cause problems with the US Government and the presence of American troops in Northern Ireland focused the minds of Irish politicians. And so, on July 6th 1942, there flew into Irish airspace the crew and passengers of a Douglas C-47 Skytrain transport. A transport aircraft with 15 serving members, officers and enlisted men, from the United States Army Air Forces (USAAF). An aircraft was observed above the airfield at Rinneanna. It circled three times before landing at 17:50 on one of the main runways. It came to a halt but then proceeded to taxi around the perimeter of the airfield for fifteen minutes. The Irish Army garrison on the field dispatched one of the fire engines with a party of soldiers to drive ahead of the aircraft and prevent it taking off again. In the days following the incident, the Irish Army officers present on the day submitted reports to their commanders on the events. Some extracts of those reports are transcribed here to illustrate the short visit. Captain Hewett of the G2 Branch, Irish Army, was assigned to the Foynes Flying boat base and happened to be at the airfield that day in an off duty capacity. Commandant W J Keane, the officer Commanding the airfield garrison reported: "The officer in Charge, Lieut, Sauer, stated that he had come from America. He left Iceland which was his last stop at 10:00 hrs in the morning. Their destination was Prestwick which is on the west coast of Scotland. The crew thought Northern Ireland was Scotland and flew south. They were not sure of their whereabouts when they arrived over Rineanna and as their petrol supply was running low the officer i/c. decided to land. They had failed to maintain contact with the D.F. station with which they were originally working. The eight officers and seven other ranks were given meals in the Officers’ and N.C.O.’s Mess respectively. Accommodation in the Camp was provided for all overnight. In the morning the aeroplane was re-fueled with 297 gallons of petrol, 200 ft. Of trailing aerial and weight were issued to the officer i/c. This item of equipment as well as the petrol was essential for flight and was issued from my unit. I received instructions from the officer i/c. G.2, G.H.Q. to allow the aeroplane to take off and fly to Northern Ireland (St. Angelo Aerodrome, Lough Erne) via West Coast. I obtained the necessary weather route forecast from Foynes. At the pilot’s request I allowed him to do a local test flight of ten minutes immediately prior to his departure. The aeroplane with all occupants on board took off at 11.45 hrs. Central Control, G.H.Q. and Report Centre, Limerick, were notified immediately the aeroplane took off. 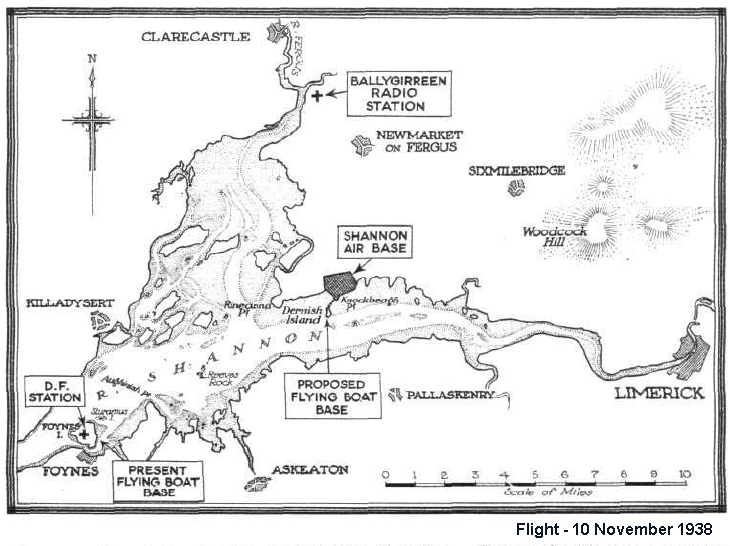 Present that day at the airfield by chance was the Irish Army Intelligence officer assigned to the Foynes flying boat base, located to the south across the estuary of the Shannon river. Captain N Hewett, had traveled to the airfield in an off duty capacity and thus was able to meet with the American airmen. His normal role was to gather intelligence from passengers passing through Foynes on the long range flying boats. The Irish Army report contains just ten sheets of notes and reports. Among these are two typed lists of names of those on board the aircraft as recorded by the Irish Army officers. These names have been researched for confirmation and a small bio of each man is presented presented below. The aircraft itself was a Douglas built C-47-DL Skytrain transport. It would have been built at Douglas's Long beach plant in California and was a military version of the famous Douglas DC-3A airliner. This aircraft had been delivered to the US Army Air Forces in March of 1942. The aircraft is mentioned in the book, C-47/R4D Units of the ETO and MTO by David Isby. This work includes a statement from Capt. John G Evans of the 12 Troop Carrier Squadron who was flying 41-7764 on the night of Operation Torch, the Allied assault on North West Africa, his co pilot being Jack B Goudy. The 60th Troop Carrier Group was assigned the role of carrying soldiers of the 509th Parachute Infantry Battalion. The operation was flown from Cornwall in England direct to the Vichy French airfields of La Senia and Tafaraoui near Oran, Morrocco. Capt Evans recounts they were one of 28 transports out of 39 that departed England to make it to the La Senia airfield. Heavy flak and the attentions of a French fighter plane seem to have ended 41-7764's wartime career. It was forced down on the dry lake adjacent to the airfield along with others and it seems the visitor to peaceful Rinneanna was destroyed by the guns of a French Dewotine D520 fighter. An extract of the book can be read here on Google books. This event is almost unique in terms of all the aircraft landings during the war in neutral Ireland in that one of the passengers, Sgt Rudy P Lenser, carried a camera and he had taken a series of photos of his journey across the North Atlantic, including photos of the aircraft being loaded and of it and its crew & passengers on the ground in Rinneanna. 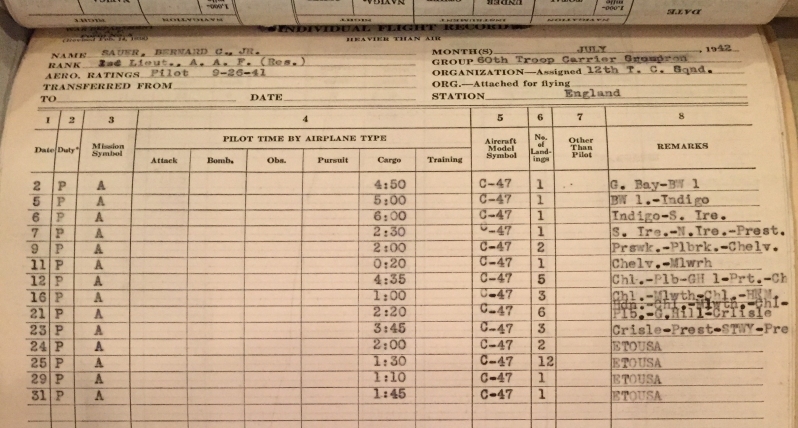 These can be matched up to the flight details shown in 2Lt Bernard C Sauer's flight log below in his profile, from Goose Bay, Labrador, Newfoundland to BW 1 field in Greenland and on again to Iceland. 26 June 1942: Planes of the 10th and 12th Transport Squadrons departed on flight to the British Isles ferrying 8th Fighter Group and 97th Bomb Group. 1st July 1942: Name of the Group changed to 60th Troop Carrier Group. His album pages are shown here below, a total of four pages covered his progression across the Atlantic. A description of the photos is below each image. 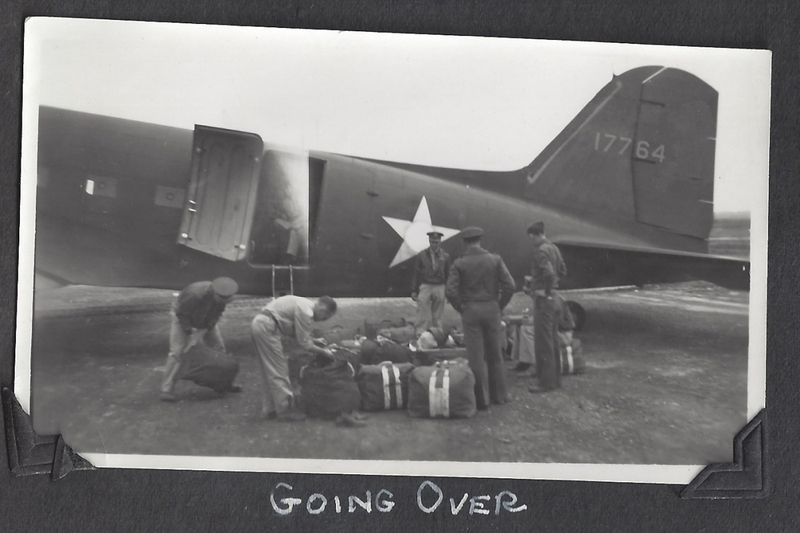 Above, you can see the actual aircraft 41-7764, with serial number presented in the typical USAAF fashion as 17764 on the tail, getting loaded up at one of the stops on the flight. 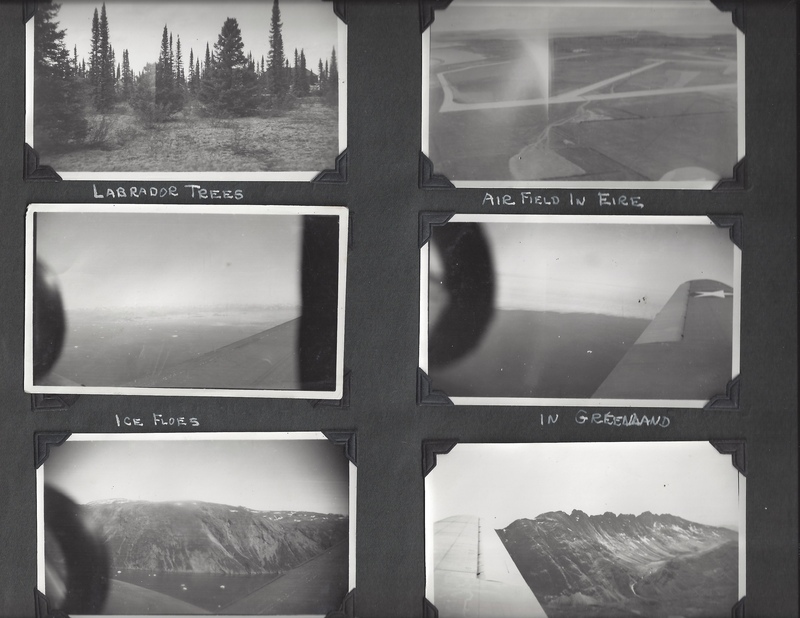 The photo at bottom is labled "Labrador Eskimos" and the airman standing on ladder is labeled "our radio man" and the aircraft is Boeing B-17 Flying Fortress serial number 41-9020. This aircraft flew with the 97th Bomb Group and features in a number of the early USAAF propaganda newsreels and press photos. This bomber was later badly damaged in combat but after repair flew as a Squadron hack aircraft. 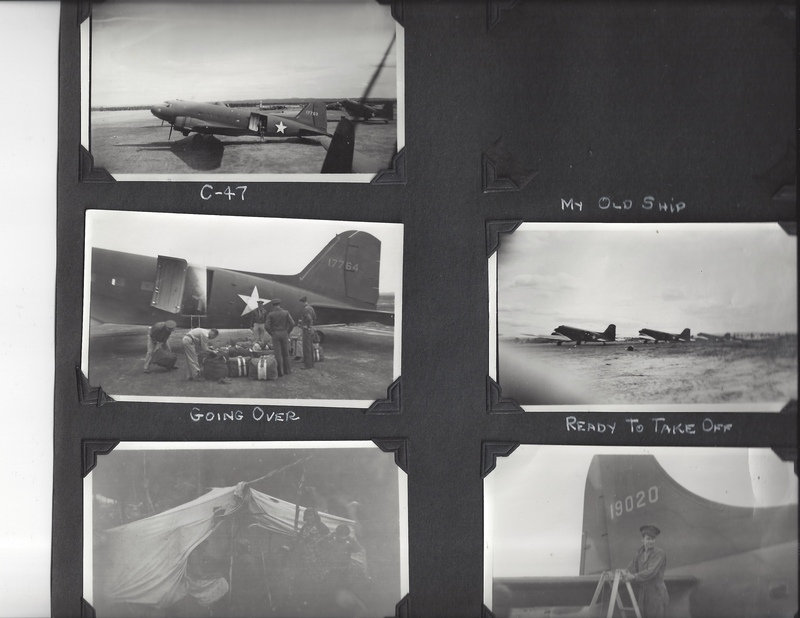 The aircraft in the photo, top left, is C-47 serial 41-7763. This served with various transport units until late 1943 when it was removed from service. No fate has been found but it was probably a well worn out aircraft by the time of its retirement. Above is the close up of 41-7764 being loaded, the photo labeled, "Going Over". 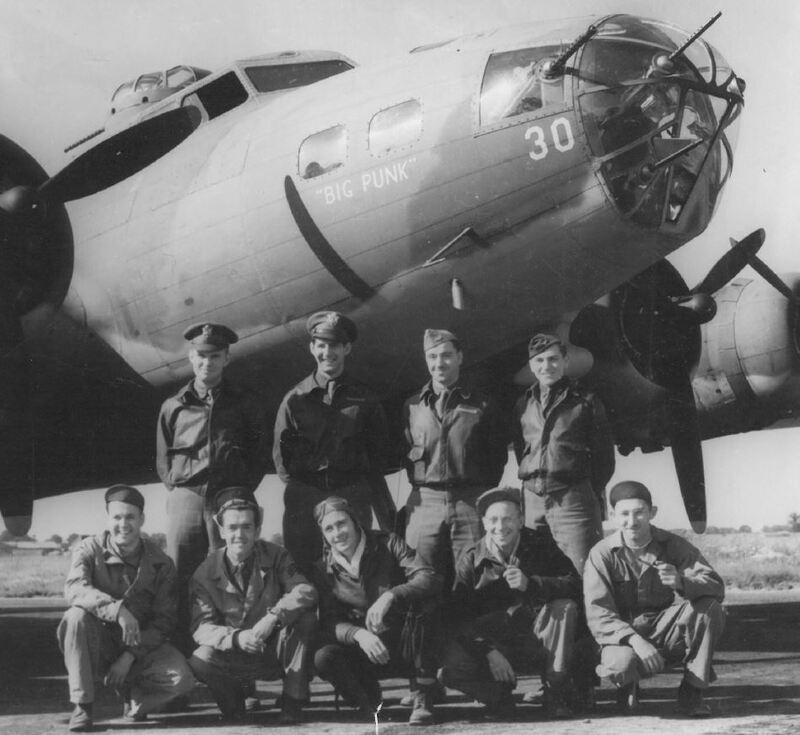 There are six men visible in the photo, but it cannot be determined if they are some of the five aircrew members or the ten passengers. There may be one more person the doorway of the aircraft Evident is a bright center to the star on the aircraft door. It would seem that this indicates a recent over painting of the old red circle from the insignia. This was done as a measure to avoid confusion with Japanese markings in the Pacific theatre. 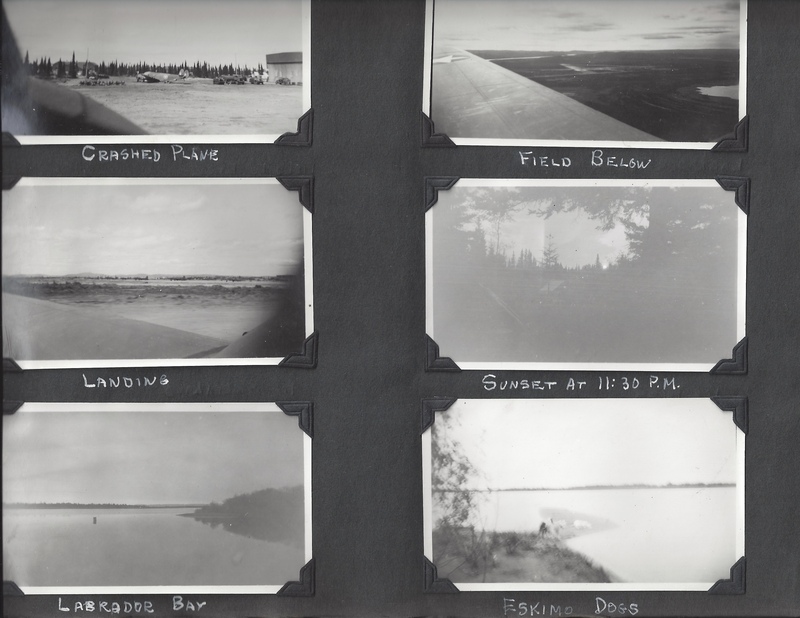 This photo album page above includes photos of his arrival it seems in Labrador, or more precisely Goose Bay, Newfoundland on one of the last days of June, 1942. They departed here on the 2nd of July, 1942. The top left hand photo shows a Royal Air Force Lockheed Hudson bomber on its belly after an apparent incident. The photo labeled 'landing' shows a line of B-17 bombers on the ground. These might well be among the very first of the bombers of the Eighth Air Force which were only deploying to the UK this week in 1942. Six of them, from the 97th Bomb Group, arrived in Prestwick on the same day the 41-7764 landed in Rinneanna. 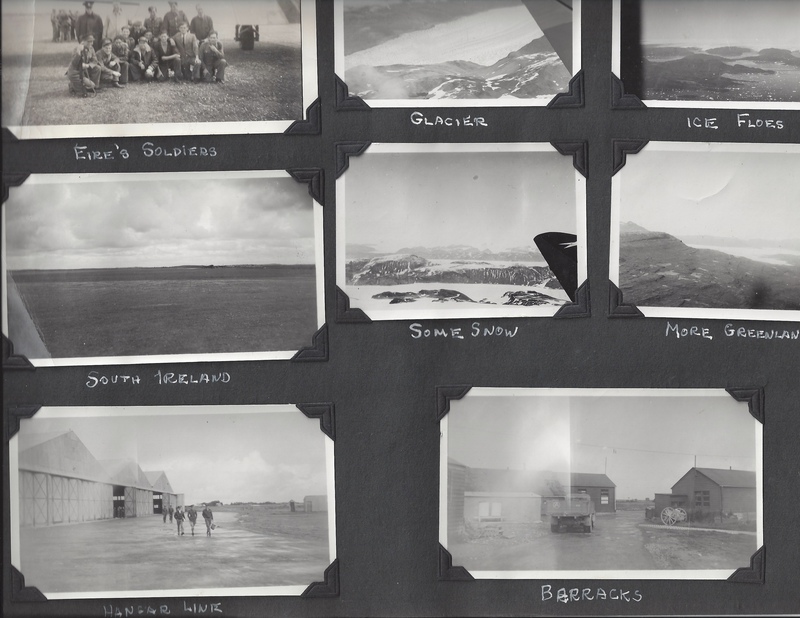 Above the third page of photos shows some of the flight on 2nd July 1942 to Bluie West One (BW-1) airfield, in Greenland. And of course, the first glance of Eire! Eire is the Irish, or Gaelic, language name for Ireland. While it was intended that Eire be used only while speaking or writing in the Irish language, it had become common in the UK and elsewhere to use the term Eire in general when talking about the Irish state which had become independent of Britain after the First World War and the Irish War of Independence. The photo at top right of the page shows the airfield at Rinneanna, not far from the city of Limerick, and which is now better known as Shannon Airport. The other photos of the Atlantic Ocean and Greenlands rugged coast must have seemed a million miles from his hometown of Oil City, Pennsylvania. And finally, above, the grand arrival at Rinneanna by 41-7764. The photo of 'South Ireland' reveals when looked at closely, that there was a De Havilland DH91 Albatross airliner also on the airfield at the time they landed. This aircraft type operated with BOAC which flew the aircraft from there to Bristol in England. 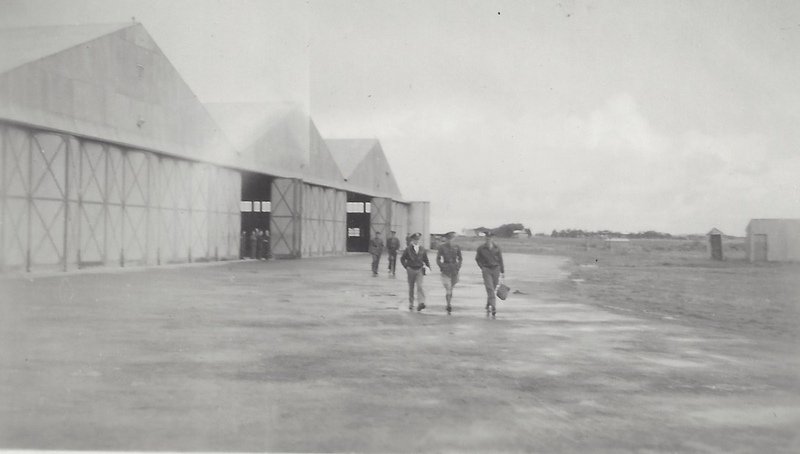 The photos of 'Eire Soldiers' and 'Hangar line' are presented below, and the 'barracks' photo is believed to be the Irish Army facility at the airfield. The photo above then shows a group of the local Irish military and perhaps some civilian staff, including an Irish policeman, a member of the Garda Siochana (back left). The man in the center kneeling would seem to be one of the American's with his fur lined jacket, and Rudy Lenser might be too his left, below the man with the trench coat, though its as likely that Rudy was taking the photo, and that man is a member of the irish Army, given the buttons visible. There are two other photos taken of this aircraft on the ground in Ireland which appeared in Donal McCarron's book, Landfall Ireland credited to Captain D Cousin's, an Irish Army Officer. The photo above is taken looking at the Irish Air Corps hangars that were later dismantled and moved to the Air Corps facility at Gormanstown, County Meath. The location of these buildings were west of the current airport terminal at Shannon Airport. It is thought that this photo might have been taken as the aircraft was preparing to depart, with two American officers being walked across the tarmac accompanied by an Irish officer in the middle. Bernard was born on 18 Dec 1918 in Ohio. His parents were Bernard and Clara (nee Wickes). He attended the Western Reserve University in Cleveland graduating in 1938. In the 1940 census, he is found living at home with his parents at 1037 Wilbert Road, Lakewood, Cuyahoga. He had two sisters and two brothers. He enlisted in the Air Corps on 10 January 1941 as an Aviation Cadet. At that time he was recorded as working as an insurance salesman. His father had been an insurance underwriter for many years. Bernard ran his own insurance agency prior to his enlistment. The San Antonio Light newspaper published September 25th, 1941, lists him as being part of the graduating class, number 41-G of 224 airmen. Sometime after his graduation he became engaged to Jean Dolfuss from Rocky River. At His name appears on a list of personnel from the 60th Troop Carrier Group that were awarded the air medal in 1943. He was mentioned in The Salem News newspaper, Ohio and his local Cleveland Leader on January 7th 1943 as being a Transport pilot. He is described as having been shot at while hauling supplies and his co-pilot being killed next to him. Sgt R A Mihelitch is mentioned in the article as being a crew mate along with Lt. Harry Husman and Sgt H W Pontius. The story behind this article is a little less tragic in some ways, as told by the History of the 60th Troop Carrier Group. 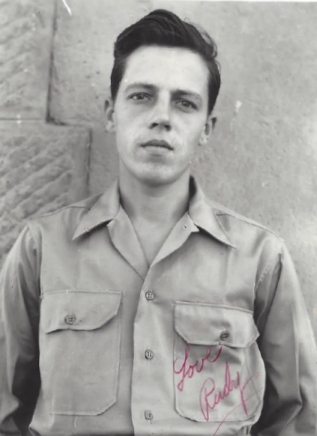 On the night of Sunday November 8th, 1942, Lt. Sauer was flying as part of the invasion force for Operation Torch and was among a group of 25 C-47's that arrived at the West end of the Sebkra D'Oran, a flat salt lake south of Oran in Morrocco. The Group history relates the story: The first plane to land with this group was that of Lt Sauer, at approximately 0830 hours. When it arrived it was sniped at by two Arab horsemen. One bulletin hit a parachutist's hand grenade, which exploded in the plane and seriously wounded Lt D A Scheerhorn, who was afterward moved to Gibralter." A search of US War time death records show that Donald A Scheerhorn from Michigan actually survived the explosion in the aircraft but did pass away at the very early age of 48 in 1965. Lt Sauer was himself taken out of service around this time with a feavour of some kind. Bernard remained in the Air Force after the war or at least in a reserves capacity. His name being listed in 1956 Air Force Journal. He passed away in Fort Lauderdale on 30 October 1999. Bernard's grandson was very kind enough to share most of the images presented here, including his flying log for July 1942. This shows his progression from Goose Bay, Newfoundland to BW 1 field in Greenland and on again to Iceland, Codenamed 'Indigo'. And from there to the landing in Ireland. His family have been able save numerous newspaper cuttings along with service documents all saved in Lt Sauer's old flight bag. Jack was born on the 27th August 1918 to John and Irma Goudy. They lived in Angola, Indiana and in the 1940 census he was recorded as being in Third year of college. He is also listed as absent from the home so was studying elsewhere presumably. He enlisted in the Air Corps as a Cadet on 29 September 1941 at Fort Benjamin. His enlistment record indicates he was employed at a filling station. The photo at left was published in the February 27th 1942 edition of the Angolan Herald, his local paper. The Herald reported often about his wartime career. He completed his basic flight training with class 42-D at Randolph Field, Texas before moving on to Kelly Field for his advanced training. This next stage of training was completed in April of 1942. The newspaper reported how the mothers of the class members were being presented with sterling silver commemorative wings. Upon completing hi straining, Jack was commishioned as a Second Lieutenant and visited his parents along with two class mates. He was then posted with them to Westover Field in May of 1942. It was from here that the 12th Troop Carrier Squadron moved to the United Kingdom in the summer of 1942. Jack was co pilot on 41-7764 on the opening night of Opertion Torch when as mentioned above, the aircraft was forced down near Oran and destroyed by a French fighter aircraft. Jack had returned to the United States by late 1944 and after leave was posted to units within America. In February 1945 he was reported as stationed at Wright Field, Dayton, Ohio. His brother George Goudy also served in the Air Force. in 1946, the two brothers took over the running of a service station in Angola. After about two years out of the services, Jack joined up again in the summer of 1948. 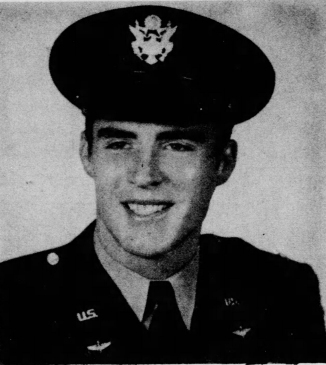 The Bakersfield Californian in October 1952 printed a short bio of the then Major Jack Goudy upon the occasion of his taking up the role of Air Force liaison officer at the Naval Air Station at China Lake. Its reads in part: “A former project engineer and later chief administrator of an Air Force photo reconnaissance laboratory, Maj. Goudy was recalled to the active duty in May, 1948. During World War II, he served with the 60th Troop Carrier Group in the European Theatre of Operations, taking part in paratroop and resupply operations during the invasions of North Africa,Sicily and Italy. He also dropped supplies to Yugoslav and Greek forces during 1943 and 1944. Before entering the Air Force, Maj. Goudy received a degree in business administration from Tri-State College at Angola, Ind. He entered the service as an aviation cadet in September 1941.” His third third daughter was born in 1954 during this posting. In August 1954, Goudy left his posting at China Lake, and proceeded to Alabama where he was to attend the Air Command Staff School as Maxwell AFB. He died on the 3 August 1989 in Greene county, Ohio, apparently at Wright Patterson Air Force Base. Manuel came from a family of six, born on 23 Aug 1920 to Esperanza and Manuel Flores in Kleberg, Texas. Just eight years later, another brother Henry V Flores was killed in action with the US Marine Corps infantry during the Korean War. Both brothers are remembered in their local town of Kingsville in the Parque Hermanos Flores- — the Flores Brothers Park. A plaque being raised there in their honour in December 2009. He was buried first in Boschweg Cemetery in Holland before in 1949 his remains were returned to his family for reburial in Fort Sam Houston, near San Antonio, Texas. Robert was born 2 December 1921 in Monteroy, California, the son of Adelaid and Norbert Mihelitch. In 1940 he was working as a ranch hand. He enlisted directly into the Air Corps in January 1942 at Camp Roberts. 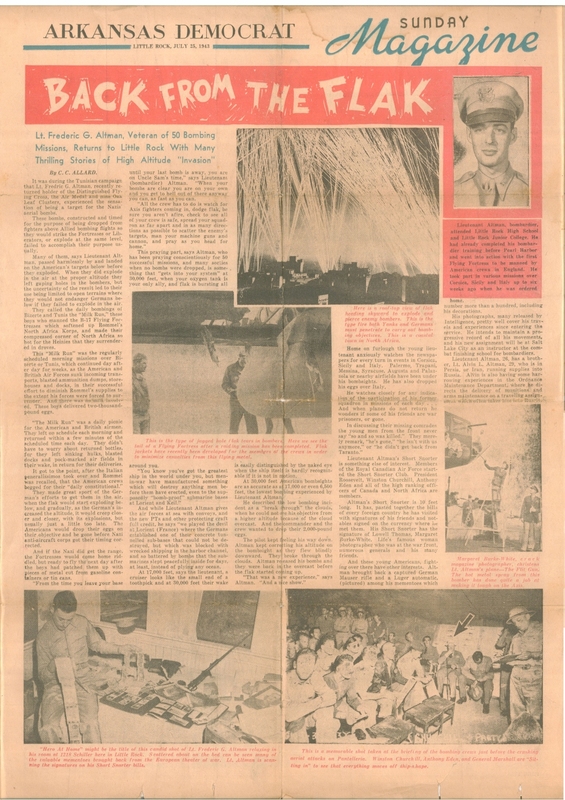 His local newspaper the Santa Cruz Sentinal carried a number of news articles about his wartime service which very surprisingly actually mention his July 1942 landing in Ireland. The 20th March 1943 seen a notice published that had been awarded the Air Medal alongside many other Troop Carrier men. The following summer he wrote home to say that he has gotten to Rome some weeks after its liberation and had gotten to see the Pope. Married Margaret Jenkins in September 1951. He passed away in 4 Oct 1991 in Santa Clara. 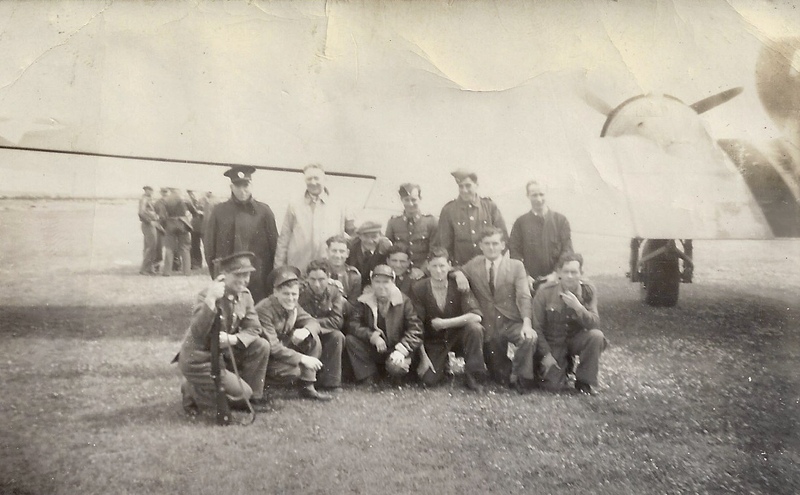 The photo was provided by his family and shows Robert standing in front the tail of the same aircraft he landed in Ireland in. The photo is likely to have been taken in North Africa given that he is wearing an infantry style helmet. Of course, 41-7764 was destroyed on the very first days of its arrival in Africa, so perhaps this photo is from the UK. 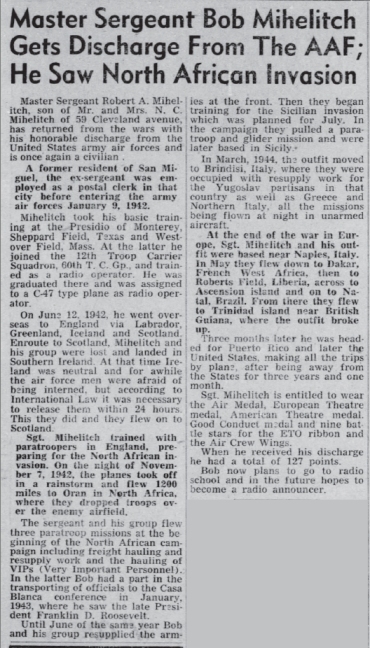 A long article was published in the January 15th, 1946 Santa Cruz Sentinel published a run down on Roberts long wartime service including the following paragraph: On June 12th 1942 he went overseas to England via Labrador, Greenland, Iceland and Scotland. 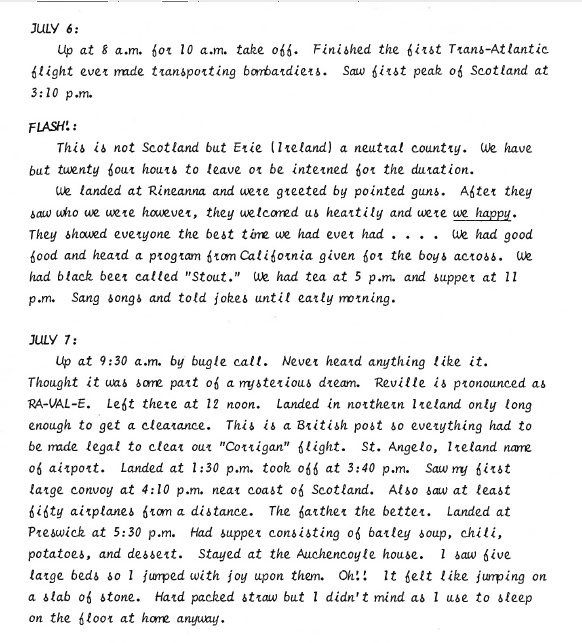 Enroute to Scotland, Mihelitch and his group were lost and landed in Southern Ireland. At that time Ireland was neutral and for awhile the air force men were afraid of being interned, but according to International Law t was necessary to release them within 24 hours. This they did and they flew on to Scotland. Cpl. Berkheimer was born on 19 Mar 1919 to Iva and Lewis Berkheimer in Saxton, Pennslyvania. 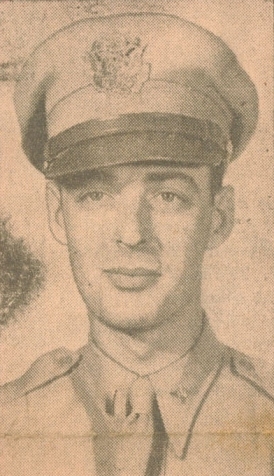 At the time of his marriage to Mildred Brinser on September 13, 1941, local newspapers describe Donald as a Graduate of the Lewistown high school and stationed at Mitchel Field, New York where he held the rank of Staff Sergeant. The wedding took place in Winchester, Virginia. The 12th Troop Carrier Squadron was based at Mitchel Field from 20th May 1941 to Dec 16th 1941. Donald it seems enlisted again in 1945 upon his return home and left the military in 1947. A postwar compensation form completed by Donald shows that the served overseas from June 1942 to December 1943 and he rose to the rank of Master Sergeant. He may have been a member of the Sgt Lawrence L Chambers, Post 710 of the VFW last in 1945. He passed away in Middletown, PA on 27 December 1996 and is buried in Indiantown Gap National Cemetery. He passed away on 13 May 1969 aged just 49. Frederic was born, February 1917, in Helena, Arkansas. Growing up in Little Rock, Arkansas, Frederic was the son of Delsie Gans and Lewis Henry Altman. At the time of his registration for the draft, he was employed with the Arkansas Gazette in Little Rock. 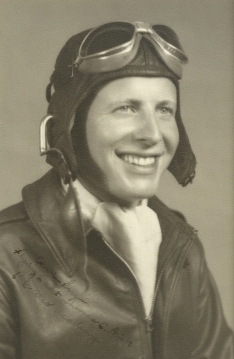 He graduated from his flying training around May 1942 at Albuquerque, New Mexico. His mother and sister Miriam attended his graduation. 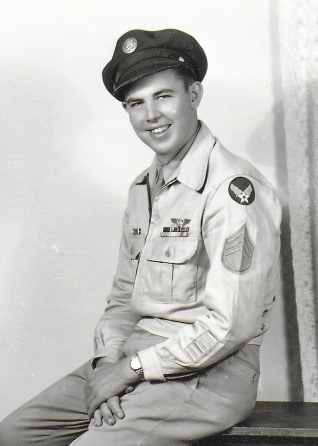 A brother Alvin L Altman also served as a USAAF officer. 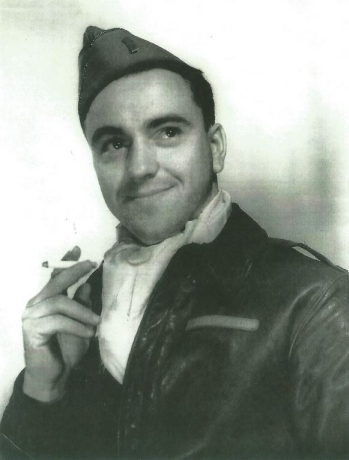 FREDERIC G. ALTMAN, First Lieutenant, Air Corps, 97th, Bomb Group. For extraordinary achievement while participating in aerial flight in the European and North African Theatres of Operations. 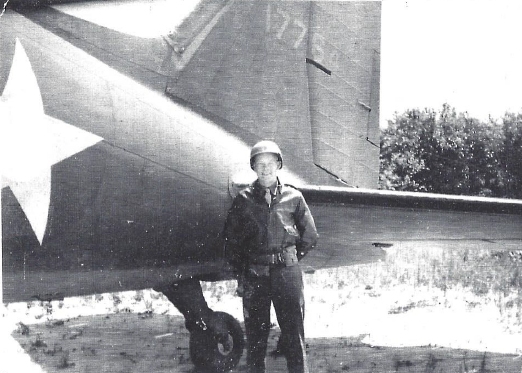 Lieutenant Altman’s outstanding courage and proficiency as bombardier on a B-17 type aircraft have contributed greatly to the success of the many combat missions in which he has taken part. On 9 May 1943, he acted as lead bombardier for a formation of more than one hundred B-17 type aircraft in the devastating bombing of Palermo, Sicily. All though his ship was seriously damaged by both flak and fighters and two of the crew were wounded before reaching its objective, Lieutenant Altman calmly concentrated on his bomb sight. Though the ship quivered from bursts of heavy anti-aircraft shells and his navigator fired his guns continuously in - repelling successive attacks as the enemy desperately attempted to turn the lead ship, he drooped his bombs squarely on the target. While the navigator cared for the wounded, Lieutenant Altman efficiently manned the three flexible nose guns, damaging several fighters and probably destroying two, alertly shifting from one gun to the other as he alternately repulsed attacks from three directions until the navigator returned to assist him in protecting his aircraft on the remainder of the flight to friendly territory. 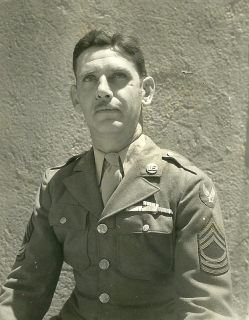 Lieutenant Altman’s outstanding skill and gallantry have consistently reflected great credit upon himself and the Armed Forces of the United States. 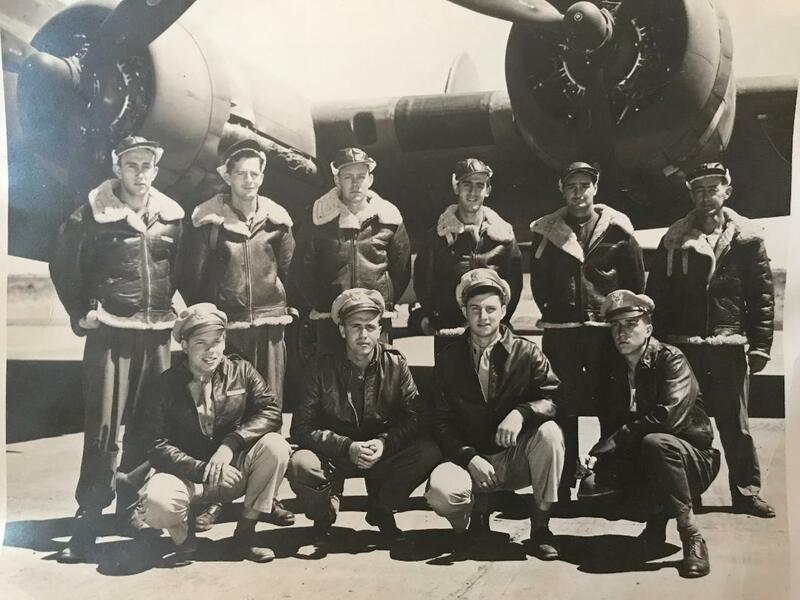 Following the completion of his tour of duty in the summer of 1943 he returned home to the US and was posted as an instructor for the growing bomber force. Like many of the men on aircraft 41-6674, Frederic was mentioned in many newspapers both in his home state and around the USA as a member of the fledgling bomber force. Upon his return, the Arkansas Democrat newspaper carried a full page spread about his previous years exploits in Europe and Africa. He died on the 8th of September 2002 and is buried in Fort Worth, Texas. Howard Blank was born on 5 November 1919 to Bella and Nat Blank. In 1940 the family were living in Terra Haute, Indiana. He enlisted in the Air Corps on the 12 May 1941 in Chicago, Illinois. His early service was acknowledged by early publication in national media as having been awarded the Purple Heart for injuries received in July 1942 when his aircraft had to force land in England for damage received over Europe. Upon returning from the war he managed a theatre in Seymour until his recall to active service. 1955 seen the now Major Blank being assigned to the post of Chief or Special Services at the Headquarters of Strategic Air Command. This role moved him from a personell officere position in Pinecastle AFB to being responsible for all sports, entertainment, Service clubs, theatres and gyms at SAC bases. In 1960 he was posted to `Germany with Strategic Air Command. He rose to the rank of Lt Col in the Air Force. Howard Blank passed away on 16 July 2004 and is buried in Sam Houston, National Cemetery. Grandson of “Uncle Jake” carries on. The fighting and patriotic spirit of the late Jacob Mooker Civil war veteran, who died recently carries on. It moves and has its being in the person of a grandson, Bombardier Second Lieutenant George L Ludolph, age 27, of St Paul Park, Minn.
For bombardier Ludolph was in the flight when the first full-fledged all-American bombing blow was launched against the Nazis. Twelve flying fortresses under the leadership of Brigadier General Ira C Eaker dropped tons of explosives on a daylight raid on the railway yards at Rouen, France. Relatives and friends in Valparaiso recently received word of the part played by young Ludolph in one of the first contacts of Americans against Hitler’s military might. As to his experience with flying fortresses, Ludolph asserted “the bombardier’s racket is the best in the world”. On Sept 6 Ludolph took part in a flight of Meaulte, France, when he was credited with getting his first ‘Jerries,” two German planes. This raid he listed as his greatest thrill. During the flight he tried to take some pictures for Paramount, but had to abandon his camera twice to man a gun. After graduating from St Paul Park high school in 1930, he attended the University of Minnesota for two years. Later he was graduated from an electrical training school in Chicago. He is the son of Mr and Mrs Edward G Ludolph of South Paul Park, Minn. Mrs Ludolph is a daughter of the late Jacob Mooker. He appeared in press articles in August 1942 following the USAAF’s first raid on France, being quoted as the bombardier of a B-17 named ‘Big Stuff’ of the 97th Bomb Group, the media outlets seem to have gotten the aircraft name mixed up. As can be seen from the photo below, he was a member of the crew of aircraft 41-9030, under command of 2/Lt William P Saunders, which carried the name "Big Punk". This aircraft flew on the very first USAAF, 8th Air Force mission on August 17th 1942 with Saunders commanding and Ludolph as Bombardier. George is to be found standing second from left. This aircraft was transferred to the 92nd Bomb Group in early 1942, and the photo is noted as being 'Lt Saunders' in the Roger Freeman collection. Rick Flack in his research into his father's wartime career identifies this as having been taken at the time of the first mission and shows crew minus one member, that flew on the 17th August 1942 mission. He was widely quoted in newspapers across the USA at the start of April 1943, in relation to his participation in a raid on Cagliari, Italy. The piece reads: Lieut. 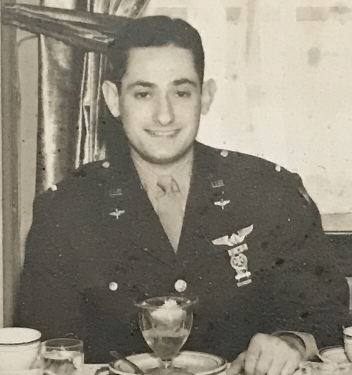 George Ludolph, a bombardier from St. Paul Park, Minn., who loosed bombs on the huge Decimomannu airfield, said that he had been on 33 sorties and the Cagliari attack was “the best ever“. “I’m sure glad that I saw the show from the balcony instead of the orchestra pit.” he said. 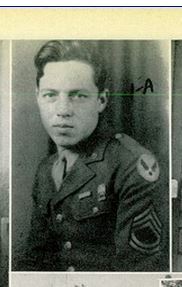 In May 1943 he was awarded the Distinguished Service Cross, the citation for which read: First Lieutenant (Air Corps) George L. Ludolph (ASN: 0-443737), United States Army Air Forces, was awarded the Distinguished Service Cross (Posthumously) for extraordinary heroism in connection with military operations against an armed enemy while serving as an Officer of a B-17 Heavy Bomber in the 414th Bombardment Squadron, 97th Bombardment Group (H), EIGHTH Air Force, while participating in a bombing mission on 9 May 1943, against enemy targets in the North African Theater of Operations. 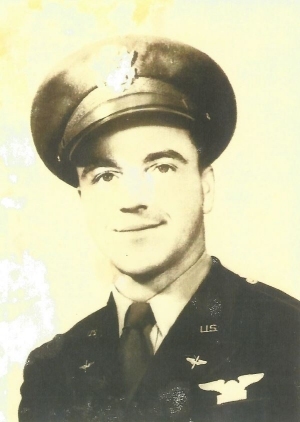 The personal courage and zealous devotion to duty displayed by First Lieutenant Ludolph on this occasion have upheld the highest traditions of the military service and reflect great credit upon himself, the 8th Air Force, and the United States Army Air Forces. ON the date mentioned in the citation above, he was flying on B-17, Serial number 41-24415, named Yankee Doodle II, when after suffering flak damage, then had most of its vertical tail and left hand horizontal stabilizer cut off in a collision with another aircraft. The damaged aircraft was lucky to return to base on that occasion. He was killed in action on the 8th of July 1943 when his aircraft, B-17 42-5090, was shot down on a bombing raid over Sicily. 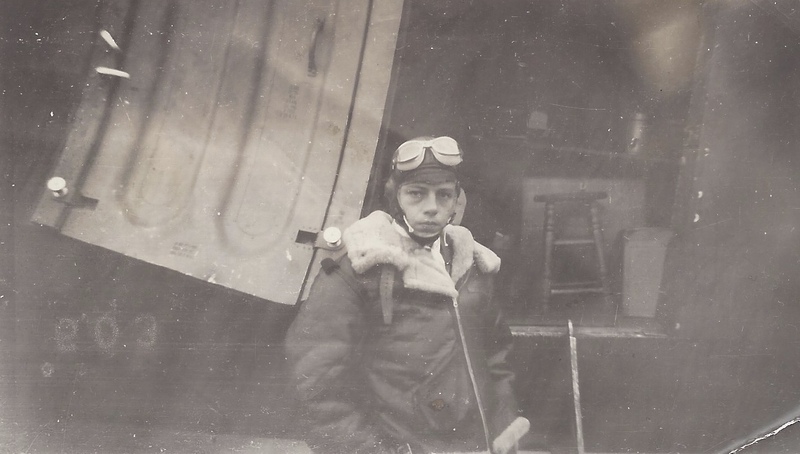 He was based at that time with teh 97th Bomb Group at Chateaudun-du-Rhumel in Algeria and his crew were en route to bomb an airfield at Gerbini in Sicily. His remains were never recovered and his name is inscribed on the Walls of the Missing at Carthage War Cemetery in Tunisia. His family received an official memorial marker which sits in Cottage Grove Cemetery, Minnesota where his parents are buried. His mother was presented with his medal decorations at a ceremony in St Paul on memorial Day, 1944. 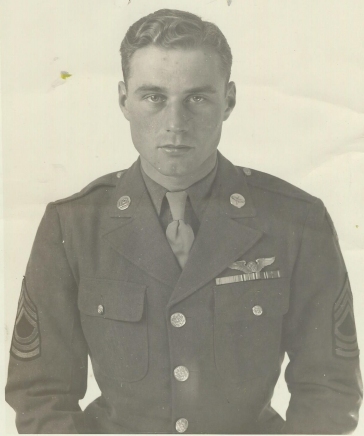 He received the Distinguished Flying Cross as described above as well as two Silver Oak Leaf Clusters. William Grace was born on May 9th, 1916 to Jane and William Grace of Pittsburgh. He enlisted on December 5th, 1941 and was deployed overseas July 2nd, 1942. He returned home to the US in December 1944, with a further short deployment between February and July 1945. He worked it seems as an optician in Pittsburg with the Shaler & Crawford company. 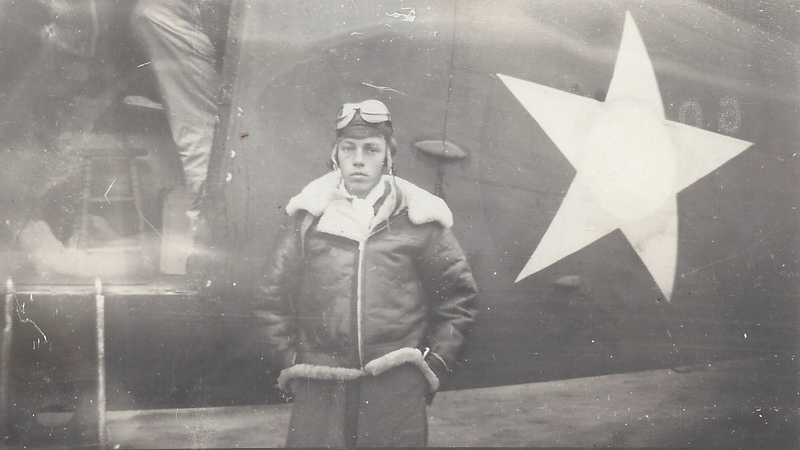 While little is known of his service history, a veteran of the 97th Bomb Group, Charles Merlo, recorded that 'Bill' Grace was a good friend of his in that unit. William died on 6th July 1993 in Pittsburgh. Charles was born in Monrovia, California on May 29, 1920, the eldest of two sons born to Charles and Elizabeth Walker. His parents had immigrated from Manchester, England in 1911 and 1919. Charles Walker was recorded on board C-47 41-7764 with the rank of Private. Checking his service number returns an entry for a 1946 enlistment of a Californian man born in 1920. A check of the batch of serial numbers between 39168920 and 39168929 however show that all other service men enlisted on the 7th or 11th of November 1941, so it is assumed that Charles initially enlisted at this time. At the rank of Private, he may not have been a member of aircrew in July 1942 and might have been a ground crew member. Confirmation of his identify comes from his having become a prisoner of war in march 1944. These photos of Charles sent by his son Gary's family, show him with various comrades. 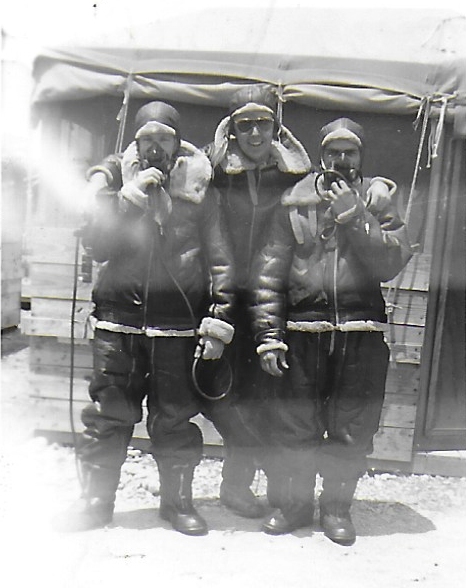 The photo of three airmen is marked on the back as: "1. Bill Williams 2. Me 3. Walto"
It is thought that 'Bill Williams' might be the B E Williams who was also on C-47 41-7764, thought the is fairly common. And of course, the men's faces are covered by their oxygen masks! The photo above has no notes on it, but is Charles with an Air Force friend. By that time, he was an aerial gunner with the 97th Bomb Group flying over the Mediterranean. His name appears in a January 1944 article where is quoted in having witnessed the bombing of the Italian port of Pola. He was part of the crew of B-17 42-30462 which was shot down over Udine, Italy on March 18th, 1944. He and his fellow crew members survived and were taken prisoner. This is recorded in the archived Missing Air Crew Report numbered 3521. His family provided the following memory of their family: "I remember several of his wartime stories, but I must have missed the illegal landing in Ireland. His crew was based in England and he might have blended the stories together without me realizing it. He told me how his plane was shot down over Italy, and about the Italian farmer who reported them to the Germans, possibly in fear of what might happen if he didn’t. 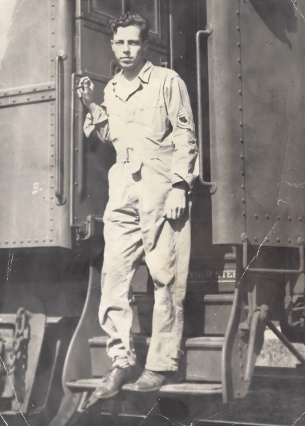 My father then stated that they were loaded onto a train and transported to a POW camp in Estonia. During the crash he had broken his arm, and the German doctors experimented with a salve that supposedly stimulated skin growth. Of course, it didn’t work and his arm, not surgically fixed properly, lost some flexibility. I actually learned from your letter the date he became a POW. I had always wondered whether he was there a short period of time or longer. I remember him telling me they were liberated by Patton. That once the Germans heard Patton was heading their way, they deserted the camp leaving the POWs on their own. 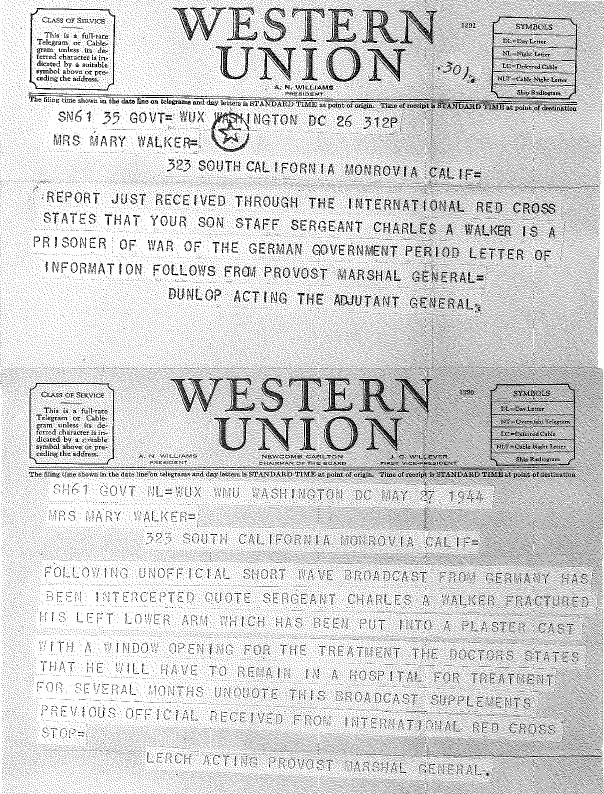 My father received the Purple Heart and is buried at Arlington National Cemetery here in Washington, D.C."
The telegrams below were those received by his parents in 1944 when his aircraft was shot down. It would appear that Charles re-enlisted in 1946 and this record survived in the US NARA punch card archive. Mildred Ann Casper married Charles Walker an Air Force serviceman on October 1st, 1948. They were stationed at several state-side bases and Puerto Rico before transferring to Loring Air Force Base in 1962. Upon his retirement in 1973 as a Senior Master Sergeant Charlie and Mildred made their home in Presque Isle where they were active members of the Presque Isle Elks Lodge. He passed away in 1996 in Presque Isle, Maine. The photo below was provided by the family of Lt Vivian D Loving and it was thought that the airman standing at the extreme left is Charles A Walker but sadly the names of the enlisted men are not recorded on the original copy the family have. Compared to other photos of Charles, it seems unlikely that it is him however. Rudy P Lenser was born on 26 March 1921 to Paul and Margot Lenser in Langfuhr, Danzig, Germany. In 1928 the family immigrated to America and settled down in Oil City, Pennsylvania. He graduated from Cranberry High School in 1939, then enlisted in the Army Air Corps in that September. 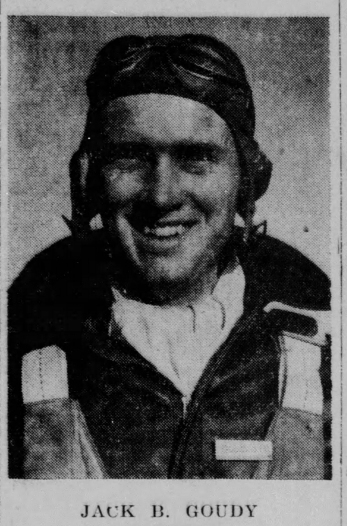 His local paper, the Oil City Derrick, reported on him a number of times, including in January 1942 that he had become "first class mechanic" in the Air Corps in 1940 and a bombardier in 1941. At that time in 1942 he was based in Tampa, Florida. He served with the 97th Bomb Group in England, North Africa and Italy until 1944. He was a bombardier or toggler, a role more typically carried out by an officer. After his tour in Italy, he was posted back to the USA, during the summer of 1944 and was reported by his local newspaper as being stationed at Walker Air Field, Victoria, Kansas for a time. At that time in January 1945 he held the rank of Master Sergeant. 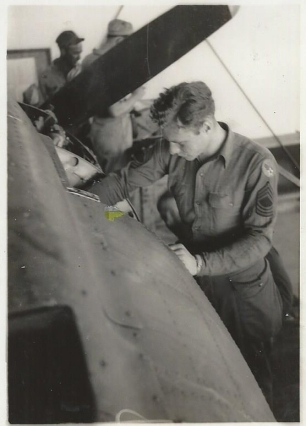 These two photos from his album appear to be Rudi standing next to the door of C-47 41-7764, with its freshly painted star marking. 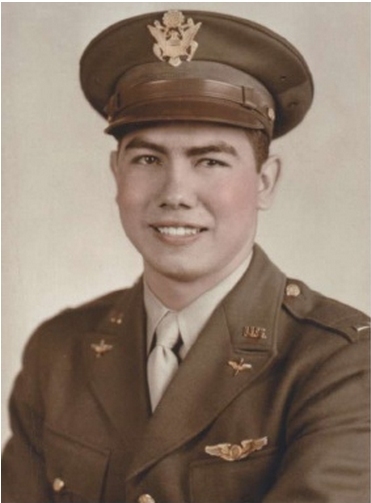 He later again served a tour in the Pacific theater from May to October 1945 with an Air Material Squadron, with newspapers mentioning that he was an electronics specialist. He had in fact been training in some of the electronic equipment fitted to the B-29 Superfortress, including Bomb sight maintenance and automatic pilot maintenance. His name found listed on the roster of the 75th Air Service Group which was assigned to the 315th Bomb Group, a B-29 Superfortress unit. He married his wife Sally in July 1941. Rudy was ordained a pastor in July 1952 in Susanville, California and served as a pastor in various communities until his death. He passed away on 14 Aug 2006 in Woodbridge, California. Frederick C Lynch was born on the 7th Dec 1904 to Mary and John J Lynch in Winchester, Massachusetts. His mother passed away when he was only two years old. Sadly the injured man, a navy sailor named Wilson Holland died from his injuries. S/Sgt Lynch was at that time based at Fort Monroe with the Coast Artillery School. It is not known when he transferred to the Air Corps, in the 1940 census he is still resident in Virginia and living with his first wife at Newport News and is listed as working at Langley Air Force base. While it is unclear what rolls Frederick under took during the war, he had a reenlistment record dated November 1945 at Langley Field, with the rank of Master Sergeant. Fred passed away on 28th July 1964 in Boston. It took some effort to determine who this officer was or whether he was a member of the Troop Carrier Group or the Bomb Group. His name was recorded twice in the Irish Army report with different middle initials, C and L, however, one of these lists has all other names correct so it was therefore assumed that his middle initial was C. The serial number has been traced however to the name Wilfred L Smith, and this allowed him to be traced to a 97th Bomb Group memorial website..
Wilfred Smith came from Shreveport, Louisiana. He was born in Arkansas, in November 1915 to Anna and James Smith of Opelousas. His mother passed away in 1938 just prior to the war. He studied at the University of Arkansas. IN the summer of 1943, he was awarded the two oak leaf clusters to the Air Medal for participation in the Tunisian campaign. Upon his return to the USA in the summer of 1943, both his local newspapers, The Times, Shreveport, and the Daily World Sun from Opelousas carried long accounts of his previous two years overseas. Wilfred passed away in April 1991 in his native Opelousas. It has not been possible to confirm who this airman was. While the Irish army did record a service number for Pvt Williams, it is either incorrect or it is from a batch of numbers that are known to be missing from the US National Archives, World War II Army Enlistment Records database. There are just 13 records for men who enlisted with serial numbers 3607xxxx and while there is no clear pattern, the majority of the names enlisted in Illinois. The same logic extends to another US Army soldier who died during the war, Pvt 1st Class Wilbur L Baldwin 36078773 from the infantry. Wilbur Baldwin was from Brighton, Illinois and was killed in Italy in on September 23rd 1943. Based on the photo above from Charles A Walker, it is possible that B E Williams was a Bill or William E Williams.